It is known as the second highest capital in Latin America, situated 20 minutes south of the Equator and is considered as a World Cultural Heritage Site by UNESCO. Quito has a lovely climate with warm days and cool nights. It is divided into the old downtown historical area and the modern commercial district. The city's charm lies in its colonial center where narrow cobble stone streets hold untold legends. 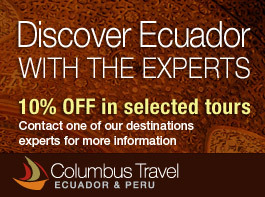 Browse among all the Quito Hotels we offer. Use the filters bellow to narrow your search results.